Researchers have successfully flown the first thermal glider through the ocean—a robotic vehicle that can propel itself for several months across thousands of miles, using only heat energy from the ocean. In April 2008, a research team led by Dave Fratantoni of Woods Hole Oceanographic Institution (WHOI) and Roy Watlington of the University of the Virgin Islands retrieved a prototype thermal glider that they had launched in December 2007 off the coast of St. Thomas in the Caribbean Sea. The vehicle crisscrossed a deep ocean basin between St. Thomas and St Croix more than 75 times, traveling uninterruptedly for more than 1,600 nautical miles (3,000 kilometers). “We now believe the technology is stable enough to be used for science. It is no longer just an engineering prototype,” Fratantoni said. The thermal glider fulfills a major step toward a long-held dream of oceanographers: launching an armada self-propelled, long-lasting, relatively inexpensive robots to roam throughout the oceans. The vehicles could measure ocean conditions over timepsans and territory impossible to attain and afford using ships, and they would report regularly via satellite to scientists back on shore. The idea was conceived in the 1980s by Doug Webb, a former WHOI research specialist who founded the Webb Research Corporation, which built the thermal glider. 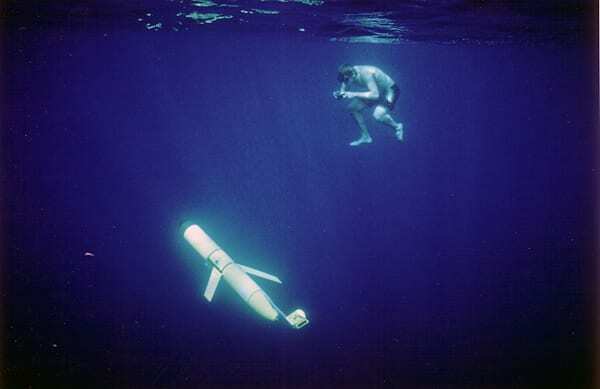 Webb collaborated extensively with renowned WHOI physical oceanographer Henry Stommel, who in 1989 penned an article in the journal Oceanography about a fleet of Webb’s gliding sentinels bobbing through the ocean. Webb and Stommel named the vehicles “Slocum” gliders for Joshua Slocum, the first man to single-handedly sail around the world. The torpedo-shaped vehicle, measuring 2 meters (6.5-feet) long, descends to about 5,000 feet (1.5 kilometers) and then rises back to the surface about 2.75 miles (5 kilometers) farther on, tracing a regular roller-coaster pattern in the ocean. 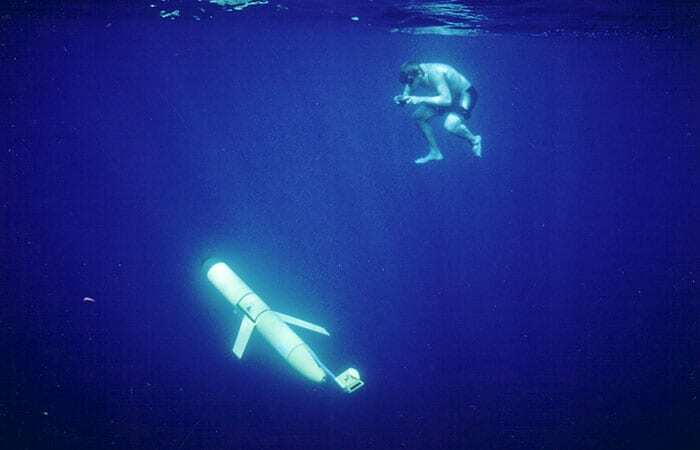 As it ascends sensors in the glider’s bow measure water temperature and salinity. At the surface, the glider reports its position and transmits data via satellite. Scientists can also transmit commands, redirecting the glider on a new route, for example. Most gliders rely on battery-powered motors and mechanical pumps to move ballast water or oil from inside the vehicle’s hull to the outside, in order to change the vehicle’s buoyancy. The new thermal glider draws its energy for propulsion from the differences in temperature between warm surface waters heated by the sun and colder, deeper layers of the ocean. Here’s work it works. To descend, a valve opens, allowing oil from a flexible bladder outside the glider’s hull to flow into a bladder inside the hull. The glider’s mass remains the same, but its volume decreases. That lowers its buoyancy and makes it sink. Beneath the glider are external tubes filled with liquid wax. As the glider descends into deeper waters with temperatures below 50°F (10°C) range, the wax solidifies and shrinks. That creates room in the tubes for oil to flow in. The glider also has an internal storage tank filled with oil and nitrogen gas that is compressed to 3,000 pounds per square inch. To begin the glider’s ascent, a valve opens the storage tank, and the decompressing gas forces oil back into the external bladder. This makes the glider buoyant again and pitches its nose upward. The glider’s wings generate lift, converting the vertical motion into horizontal flight. As the glider rises toward the surface, where temperatures reach 80°F (27°C), the wax in the external tubes liquefies, forcing oil out of the tubes and into the storage tank. That recompresses the gas again, effectively resetting the “spring” to launch the glider’s next ascent. “We are tapping a virtually unlimited energy source for propulsion,” Fratantoni said. The computers, radio transmitters, and other electronics on the glider are powered by alkaline batteries, which are, for now, the principal limit on the length of operation. Webb Research is working to reduce the electrical needs of the instruments, while also developing the capability to convert some of the thermal energy to power for the electronics. 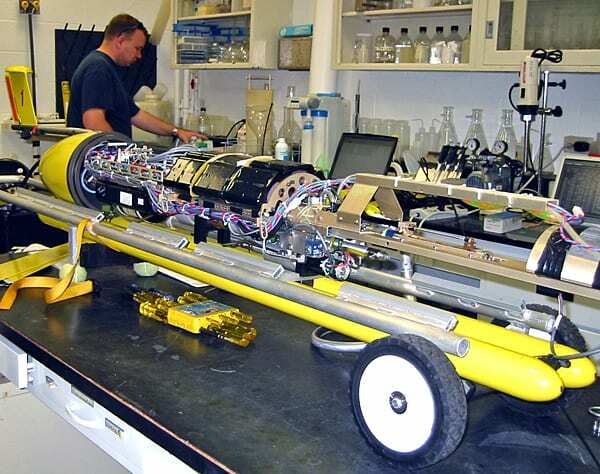 Over the past decade, Fratantoni’s Autonomous Systems Laboratory has become Webb’s chief scientific partner in Woods Hole, testing and deploying the gliders in various underwater environments. Many battery-powered Slocum gliders have been deployed in shallower waters for coastal studies, for acoustics and marine mammal research, and for studies of currents and ocean circulation. Recent funding for scientific missions and field testing of the thermal glider system has been provided by the U.S. Office of Naval Research and the Grayce B. Kerr Fund.